Don't be fooled by cheap imitations. Buy the original race-tested Guzzi Power smallblock (V50-V750) sump spacer. 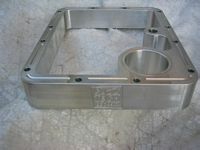 This carved billet piece will allow the owners of smallblock guzzis to add an extra 1-1.25 quarts of oil to their sump capacity, thereby reducing the tendency for these bikes to run out of oil. Here's a little background information. The stock sump on these bikes holds a mere 1.75 quarts of oil. 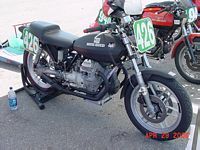 The Breva 750 and other 750's in particular have been known to take a significant amount of mileage to properly break in and seat the piston rings. Up to this point, the bikes burn more oil than normal. You should check the oil level in these bikes after every few hundred miles or so. Failure to do so may result in an easy $2000 in engine work due to low oil and a torched crankshaft! I have personally seen two of Guzzi's own demo bikes fall prey to this design flaw. 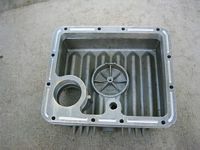 This sump spacer gives you a little more oil capacity and therefore a little more peace of mind. This spacer uses the stock oil filter with an included aluminum spacer. Price: $259.99. Sold complete with longer oil filter bolt, one oil pan gasket, longer oil pan bolts and an aluminum oil filter spacer. ...and Barry Ferris' cafe V65!